The 46th and a half President of the United States, Phil Ken Sebben, with staff. It’s been years since we last saw former superhero-turned-attorney Harvey Birdman trying to keep classic Hanna-Barbera characters out of jail—and in that time, he’s apparently been making some serious career moves. Today, Adult Swim announced that Harvey Birdman’s returning to television in a half-hour special, Harvey Birdman, Attorney General, which finds the lawyer stepping into his new role in President Phil Ken Sebben’s administration. After Sebben (voiced by Stephen Colbert) becomes the 46.5th President of the United States, Harvey takes it upon himself to get the megalomaniac out of office before he has a chance to burn the country to the ground. In a press released styled after an official announcement from the White House, Harvey Birdman co-creators Erik Richter and Michael Ouweleen didn’t go so far as to draw a direct comparison between Sebben and Donald Trump. But when the subtext is that loud, it’s difficult not to see the parallels. 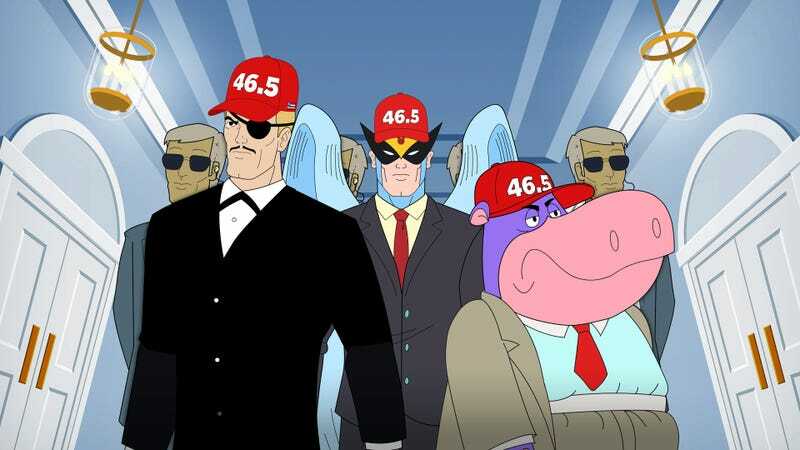 While no hard release date has been set for Harvey Birdman, Attorney General’s premiere this fall, at the very least, it’s confirmed that the voice cast of the original series—including Phil Lamar, Paget Brewster, and Peter MacNicol—are returning. Get hype.